NoQ wrote: So we just need a tile that has cliff texture but doesn't have a decal. This is possible with mods too, i think. We can also enable or disable cliff decals globally via map-mods (just include *decals.txt inside the map). No, I mean that map maker could be able to create maps where cliffs will have decals or not in the same time. tiles could have some kind of special marker for decals. @Mangust: That was just what NoQ was trying to say except that instead of having a marker for decals, there would be a marker for not having decals, preserving backwards compatibility. Jorzi wrote: @Mangust: That was just what NoQ was trying to say except that instead of having a marker for decals, there would be a marker for not having decals, preserving backwards compatibility. we just need a tile that has cliff texture but doesn't have a decal. 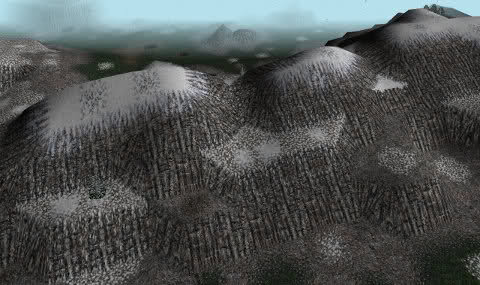 If we rely on snowiness of the underlying terrain, we still need two diagonal half-tiles. Icecaps are completely different from other tiles of that sort; they might deserve an extra decal. They are sort of half-tiles, but straight. What about simply making 3 types of snow tile decals that can be blended in by the engine - light snow, spotty snow, and thick snow? Each tile could contain a transparent layer so that the tile underneath could show through, perhaps? Or am I missing how the engine works (since I thought we already did this for road, track and craters)? Yeah, that's what i'm refering to as "relying on snowiness of the underlying terrain". I bet I can come up with something in GIMP. Texture sizes need to be 2048x2048 each, right? For cliff decals the resolution is only 128x128 per tile (any way to increase this? ), although you probably want to work in a higher resolution like 512x512 or something (doesn't even have to be power-of-two) and then downscale and add borders as a final postprocessing effect. Yeah, smooth terrain textures are currently 512x512 (probably 1024x1024 in master, but 512x512 in 3.1 beta releases, to save size), and decals are 128x128, but smooth textures are stretched over more than one tile, so this is sort of fair. It is possible to do rockies the easy way, having only three sorts of tiles (half-diagonal, full straight (maybe two of them), full diagonal). In this case, tile 54 (1/4 cliff icecap) will be half-diagonal, while tile 77 will be full-diagonal, and it will look good. Also, i just tried taking the decals of urban into rockies. Didn't really like it Well, doesn't look bad, but doesn't solve the issue either. Sorry for the delayed response, was busy. That was Dawn Of War II. Dawn of war 2 is more of a squad-rpg with rts elements, requiring highly customized landscapes for the campaign while making the map editor somewhat inflexible. Not sure how much of it is applicable for warzone. @NoQ: Unfortunately my free time is exremely limited for the moment, but I can send you the source files if you want.